There is a lot more to be said about St. John Chrysostom, but I will only note the following – he was not a people pleaser. And that means, that he did not sacrifice who he was, and that was a Christian, one motivated by a love for Christ in order to please other people. 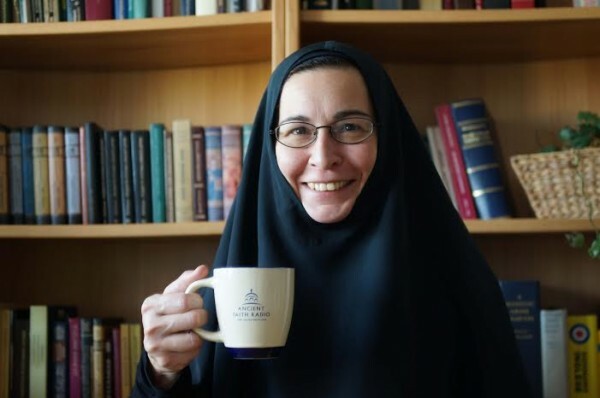 Hello, I am sister Vassa and I am making my coffee right now here in Vienna in Austria. We have a very exciting episode today because we are going to talk about St. John Chrysostom, a very important figure in the Byzantine tradition. He is so important, in fact, that if you don’t know anything about him, you should really drop everything, that’s right, everything, and find out about him. St. John Chrysostom (+407) is remembered really throughout the entire year, because his Divine Liturgy, the Eucharistic Liturgy of St. John Chrysostom is celebrated almost the entire year with the exception of most days of Great Lent and some other days in the year. 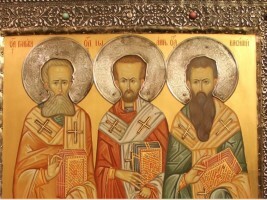 And we also have several feasts in his honour : on January, 27 we celebrate the Transfer of his relics to Constantinople from Comana in Pontes where he died on the way to his exile; on January, 30 he is celebrated as one of the Three Holy Hierarchs along with Basil the Great and Gregory the Theologian. September, 14 is the day of his repose but we actually have no service to him on that day in the Byzantine tradition because it is also the Feast of the Exaltation of the Cross. So, his main feast is celebrated on November, 13, which according to some sources is the day he became Archbishop of Constantinople. St John is known for his eloquent preaching for which he was called already during his lifetime Chrysostomos, which means “golden-mouthed”. So, let’s take a look at the life of this Great Saint. St. John was born in ca. 349 in Antioch of Syria in ancient city on the river Orontes. It was once the capital city of Syria. But today mere ruins of this once great city lay in the modern city of Antakya in Turkey. Antioch had a very vibrant pagan population and pagan customs as well as a large Jewish population, but it was also an important centre of early Christianity, evangelised by the Apostles: Peter, Paul and Barnabas; and Antioch was called “the cradle of Christianity” because according to the book of Acts “Antioch’s converts were the first to be called Christians (Acts. 11:26). John was born to wealthy parents named Anthusa and Secundus, who was a higher ranking military officer. But Secundus, John’s father, died shortly after the birth of John, who was brought up by his Christian mother Anthusa, to whom John remained very close through her life. John studied under the famous pagan teacher Libanius, from whom he acquired the skills of rhetoric and a love for the Greek language. At age of 20 John became a catechumen which means he was preparing for baptism. As I mentioned in several previous episodes (Zillions) it was not customary yet for Christians to be baptised as infants. They did this at an adult age. John studied theology under Diodore of Tarsus (+ ca.390) at this point, and he also felt a strong desire to dedicate his life to asceticism to become a hermit. But, his mother opposed this, so he promised her that he would not leave her and become a hermit during her lifetime. After 3 years as a catechumen, John was baptised and also ordered reader by the Bishop of Antioch St.Miletius. John’s mother died when he was in his late 20s, so, he became a monk in the mountains outside Antioch and lived as a hermit for 2 years living a severe ascetical life strictly fasting, barely sleeping and committing the Bible to memory. But he so weakened his health though ascetical practices that he was compelled to return to Antioch where he ended up serving as a priest for 20 years. 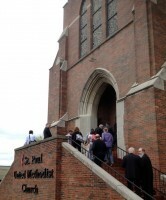 As priest, John became immensely popular and well-known as a very gifted preacher. Now, although John lived during the time of Arian controversies and other theological controversies, in his sermons he did not focus on dogmatical formulations but rather on the practical application of Scripture in everyday life. He particularly focused on the importance of charity to the poor and he often admonished the wealthy for their neglect of the needy. In the year 397 he was appointed by the Byzantine Emperor Arcadius (395-408) Archibishop of Constantinople. At this time, the church of the capital city of Constantinople was in disarray with the clergy leading a life of luxury and much corruption. Thus Chrysostom became very unpopular with both the clergy and the other wealthy of the city particularly with the Empress Eudoxia, the wife of Emperor Archadius. You see, the empress often suspected that John was actually criticizing her personally. There is a lot more to be said about St. John Chrysostom, but I will only note the following – he was not a people pleaser. And that means, that he did not sacrifice who he was, and that was a Christian, one motivated by a love for Christ in order to please other people. That means he was motivated by love not by fear. He did not fear human opinion even when it was the opinion of other hierarchs and very powerful people because his focus remained on God and His Word. You see, when we fall into the rut of people pleasing (Zillions) which has been called “the disease to please”, we experience a loss of focus. We shift from attending to our connection to God and attending to His Word, and replace that with a focus on the ever-changing, and thus uncontrollable phenomenon of human opinion. This focus is tied to a fear of rejection of not being liked or we may imagine that we are kind to others or even being some sort of peacemakers, but people pleasing actually leads us to lose our own inner peace without which we cannot truly benefit others or ourselves. Of course, it is easy to fall into this rut, when we are not focused on God and His Word, on serving Him, because you have got to serve somebody as Bod Dillon says: “If you are not serving God, you are going to end up serving somebody or everybody else”. When we do fall into this rut, let’s remind ourselves to refocus on God in quiet daily prayer and attention to His Word which tells us among other things: “Love your neighbour as yourself” (Mk. 12:31). And that means, that we can’t care for our neighbour without first caring for ourselves. Thus a focus on serving God and His Word help us to let go off the constant need that is self-destructive and unhealthy – to serve everyone else. That is it for today, Ladies and Gentlemen. Before you go, please take a minute and subscribe to this channel on YouTube, it is under the video. If you are not watching this on YouTube, you have to click on YouTube in the bottom of the video and then click on “Subscribe”. Ok, please do that for us. Thank you very much. Well, that’s it for today. 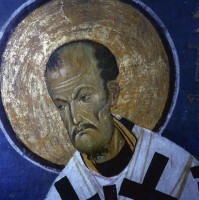 St. John Chrysostom. Today I would like to reflect on what I find is St. Basil's most striking quality…. his inconsistency.